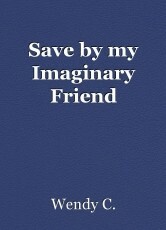 Save by my Imaginary Friend: Chapter 3, book by Wendy C.
Cassie told Kyle Baldwin where Emily was. “Cassie, have you thought of a way for us to escape?” Emily asks. “No, I am sorry. Kevin has not left and it not safe to try to escape. Do not worry, I will think of something,” Cassie told Emily. “I know you will. I am just scared. I wish I have some of my books to read and I am scared to ask Kevin if I can have my backpack,” Emily says. “Kevin is not going to hurt you for asking him to get your backpack just tell him you are bored and would like to read your books,” Cassie says. “Where is Kevin?” Emily asks. “One of Kevin's personality is taking over him so that why he has not come to visit you yet,” Cassie says. “Which personality is it?” Emily asks. “It is Dennis,” Cassie says. “Do you think Dennis is going to kill me?” Emily asks. “No, I do not think any of Kevin's personality is going to kill you,” Cassie answers. Kevin came to visit Emily. “Kevin, I have some books in my backpack and was wondering if I can read them?” Emily asks. “Yes, I will go get them,” Kevin says. Kevin came back with Emily's books and he also brought some more books for Emily to read. Kevin got Emily toys too. Emily starts reading A Little Princess. After Emily finish reading she went to sleep hoping that Cassie has found a way to escape. Emily thought Kevin was a nice person but she is wanting to go home to her mom and dad. Emily saw Kevin dressing like a little kid. “My name is Hedwig. Do you want to play hiding-go-seek?” Hedwig asks. “I never play hiding-go-seek. How do you play it?” Emily asks. “Emily, you will be it and you will count to one hundred. I will go hide,” Hedwig says. It took forever to find Hedwig. “Hedwig, I give up where are you?” Emily asks. “Why are you out of your room?” Dennis asks. “I was playing hide-go-seek with Hedwig,” Emily answers. “You need to go to your room now!” Dennis yell. Emily ran to the room. Emily was hoping that Cassie found a way for them to escape. Dennis scared her and she did not like him. Kyle Baldwin heard the news about Emily Brooks. Kyle Baldwin calls his dad Tom. “Dad, do they have any ideas who might had kidnap Emily Brooks?” Kyle asks. "The police think that Emily's father or one of Dr. Fletcher's patient might have kidnapped her,” Tom says. “Is there anything I can do to help?” Kyle asks. “We can use the help. You can see if you can find Kevin Wendell Crumb,” Tom says. I will start looking and I will ask Shawn to help,” Kyle says. “David Dunn could use your help. David Dunn is also helping the police find Emily,” Tom says. “I will call David tell him that Shawn and I will help him. Tess Doerner is also helping,” Kyle says. “Kyle I need your help,” Cassie asks. Emily is not the only one who can see Cassie because Kyle could see her too. “What is going on, Cassie?” Kyle asks. “I know where Emily is,” Cassie says. Kyle waste no time on calling David Dunn. Cassie told Kyle that they have a long drive ahead of them. Cassie told Kyle that Kevin Wendell Crumb kidnapped Emily. Kyle did not call his dad because Kyle was still wanted by NTAC. Kyle's dad work for NTAC and Kyle did not want to get his dad in trouble. Kyle and Shawn start talking. “Kyle, have you heard from Jordan Collier?” Shawn asks. “No, I have not because Jordan and I have a disagreement so I left. I am sorry Shawn you try to tell me that Jordan was evil and I did not listen. Dad, try to tell me too but I would not listen,” Kyle says. “Do not worry about it Kyle it is all forgotten. I am just glad we are speaking again,” Shawn says. “Hey, Guys, Cassie warn me that Kevin turn into a monster and is really strong. We have to be really careful,” Kyle says. “I know Kevin turn into a monster. Casey Cooke told the police that Kevin turn into a monster," David says. This page was created in 0.5120 seconds.